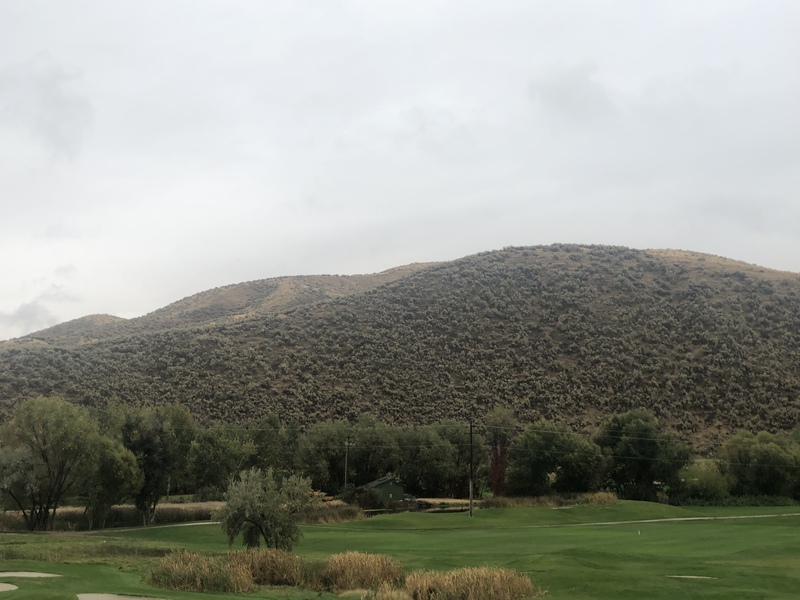 Neighbors will meet next week to hear about a proposal for a new subdivision in the Boise foothills, which could add a raft of new properties to an area above Hillside Junior High, near Quail Hollow Golf Course. 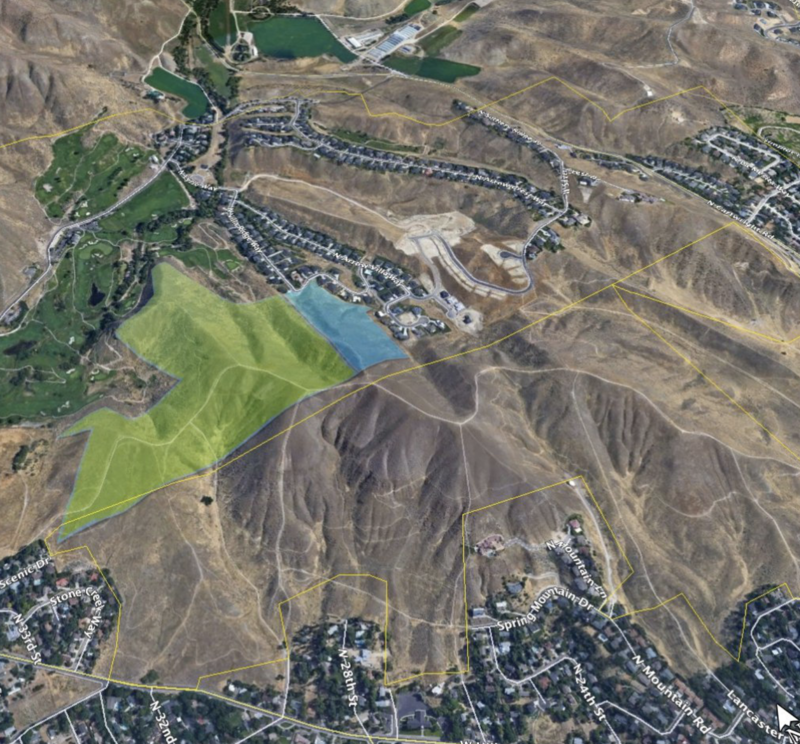 Connell Development informed the Central Foothills Neighborhood Association it intends to expand development within the existing Eyrie Canyon development, as well as subdividing a large agent piece of land for new homes. According to a letter to the neighborhood association posted on Facebook, the project would modify the existing conditional use permit for a 12-acre parcel, and add a new 70-acre piece of property next to it to the development. The area in green shows a new property that could be subdivided, while the area in blue shows an area that would be modified. Image courtesy Central Foothills Neighborhood Assoc. The letter did not outline how many homes are being proposed, what the timeline for development or any other details about the project. A representative for Eyrie Canyon did not return a phone call for comment. The neighborhood meeting is required by the City of Boise before development can begin, and will be held on Tuesday, October 9th at 6 p.m. at Cynthia Mann Elementary School. Boise Mayor Dave Bieter proposed during his State of the City address last month a permanent freeze on some housing development work in the foothills. But the idea only included subdivisions that would require annexation into city limits or a zoning change. The concept must also pass muster with Boise City Council, which hasn’t yet taken up the matter. Bieter said protecting the foothills is an important way to protect Boise’s quality of life in the future. “And when we imagine Boise decades from now, don’t we always view the foothills as they are? You have shown by your votes in 2001 and 2015 that our foothills are priceless,” he said, referring to the foothills levies passed by voters. The Eyrie Canyon project does not appear it would fall under Bieter’s potential freeze anyway, as it does not require annexation and is already zoned residential. Losing this area would be a huge blow to runners, hikers and mountain bikers. It’s one of the most accessible trail systems that you can walk to from the local neighborhoods. This area is vital. I know these moneybags developers come in from out of state and buy up all these large parcels of land to put houses on them, with no regard to the communities theyre impacting. They have no soul and only care about money. The right thing to do would be to donate this property to the Boise Parks and Rec or give the city the option to buy it. These trails are a valuable recreational resource for our community and need to be preserved. I frequently bike and walk my dog in this area and losing it would be a blow to our trail system. The hills would need to be mowed down to build homes. The large parcel of land has been the subject of a law suit that the land owner lost. He does not have any easement to his land. The only way to get it is to go through Wintercamp on land that has already been deemed unbuildable. Taking away the natural buffers that slow water may cause the lower to flood. Read the history of Ellicott City, MD. Over the years, growth turned absorption areas into concrete riverbeds. Not against the growth, just hoping a solid check and balance system is in place.